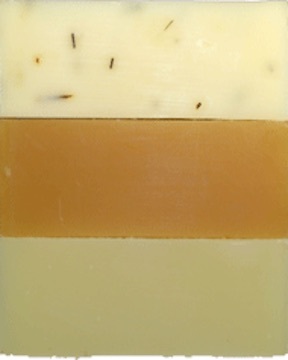 Our Seasonal Soap Trio is created using our choice of three seasonal scented soaps. For Fall and Holiday season we select from Mulled Cider, Pumpkin Cream Goat Milk, Baked Apple Pie, Holiday Spice, Cobbler Spice Cream Goat Milk, Christmas Tree Forest, Gingerbread Cream Goat Milk, Candy Cane, Cranberry Spice Cream Goatmilk or Cranberry FIg Goat Milk Soaps. This Seasonal Soap Trio Gift iincludes three full size soap bars individually wrapped in colorful, coordinating paper cigar bands over corrugating cardboard and stacked inside a clear, cellophane bag, tied with matching color raffia. A gold foil product label identities the soaps inside the soap gift.